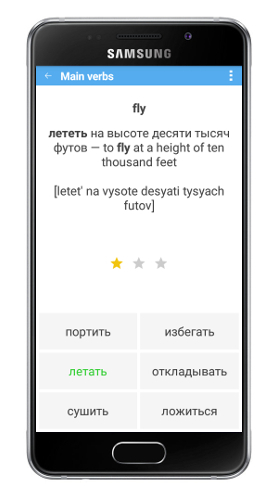 This application will help you to learn Russian language in easy and interesting way. You will find that phrases are easier to remember, because they have meaning, they paint a picture, they tell a story. The easiest way to create the new dictionaries is use a personal computer and spreadsheet-template (download ruplus.xls for MS Office or ruplus.ods for OpenOffice). russian_phrase="Он был для них как [отец]." english_phrase="He was like a [father] to them." russian_phrase="я не знаю, как [начать]"
english_phrase="I don't know how to [begin]"
question="После _____ он пошёл в кафе."